Size Available in various sizes. Features Waterproof, Dustproof, Reinforced with nylon rope and metal eyelets all around. In order to meet the growing pace of competition, we are indulged in offering Tarpaulin Lorry Cover. The covers that we offer can be availed in various sizes and colors. These covers are extensively used as for trucks; lorry and covering cloth for open goods and yard. Our covers are available in customized forms, as per the specifications provided by the clients. The offered covers are admired for their durability. 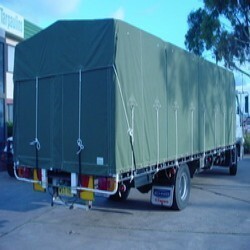 Besides, we also offer these Tarpaulin Lorry Covers at market leading prices to our customers. With long experience in the manufacturing and marketing in Tarpaulin industry, we have been able to create a distinct niche in the market as manufacturers and suppliers of HDPE Tarpaulin, Waterproof Cotton Canvas Tarpaulin, Polythene Sheets, HDPE Fabrics,PVC Tarpaulins,Shade Net, Synthetic Non-Woven Carpets and Polythene film in Eastern zone of West Bengal, Bihar, Orrisa, Jharkhand and North East. Also, We are Sole Distributor of "RHINO WRAP" A New Generation Multipurpose UV Stabilized, Coated, Polyolefin Fabric Tarpaulin,manufactured by Multinational Company "INTERWRAP POLYMER PRODUCTS Pvt Ltd". The team working with us is diligent and idealistic. Working on the devised principles and policies of the company, they work to make our products meet industry specific requirements. Products offered by us are designed and developed in an acute industrial environment using quality raw materials. Our products have been successful in meeting the requirements of clients from different industrial segments like automobile, pharmaceuticals, sugar & cement, mining and infra companies. These are also brought into application in poultry farms as well as and spice boards.